Welcome! 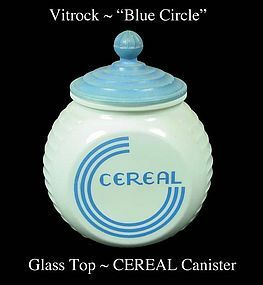 This is a hard to find, original, blue Glass lid CEREAL canister jar by Hocking, signed Vitrock, with the blue deco circles. It is in excellent, vintage condition with no chips, no cracks, no dings and no wear. The lid does show signs of fading, original paint. The knob is intact. Stands 6 1/2 inches in height, to the top of the lid. This item comes from a personal collection. We have other canisters from this collection, and will gladly combine shipping on multiple purchases. Thanks for stopping by.